Remember the cult favourite, Lucas Papaw Ointment? Well, this one from Suvana, also an Australian brand, is one alternative for those who've sworn off petroleum jelly (which the Lucas Papaw Ointment contains). As I bought my tube almost a year ago, the name and the artwork that you see here on the tube is the previous version. I've done some checking and I see that the Suvana Paw Paw & Honey Certified Organic Balm (my tube) has had a little flip in the name. 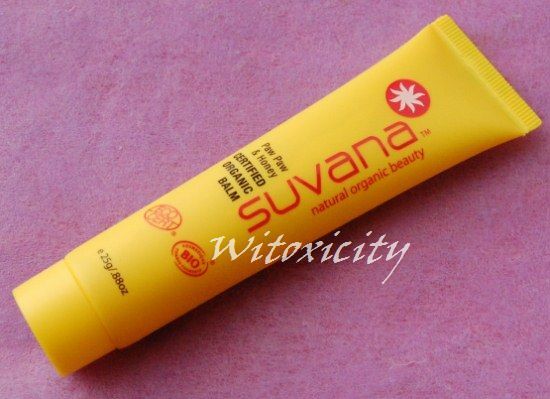 It's now: Suvana Certified Organic Paw Paw & Honey Balm. Same thing. The Suvana Certified Organic Paw Paw & Honey Balm (henceforth Suvana Paw Paw & Honey Balm) has a cult following of its own too, I believe. Just like the Lucas Papaw Ointment, it's a multi-purpose balm and it contains paw paw (papaya) extract. It's all-natural, contains no nasties and is ECOCERT-certified too. And no, Suvana does not test on animals. It's a soft balm that melts easily on contact with skin. It doesn't feel gritty and it hardens slightly in low temperatures. It has a mild, unobtrusive honey scent with a hint of vanilla. It has cocoa butter but that's not quite coming through in the overall scent. • Lips - it works great to keep lips moisturised and the waxes leave a protective layer to prevent lips from drying out (well, that's really what most lipbalms do anyway, correct?). • Problem patches - A while back, I had a frustratingly dry, red, itchy patch on my leg that wouldn't go away. For several weeks, I tried different remedies, including (diluted) tea tree oil, manuka honey, Aquaphor and this Suvana Paw Paw & Honey Balm, but none of them worked. In the end, I had to resort to using a teeny tiny bit of steroid cream (which I really really, wanted to avoid) and after two days, I started using the Suvana Paw Paw & Honey Balm on that patch. The Suvana balm didn't solve the problem (the steroid cream did) but it did help with the healing process. • Nails and cuticles - I'm not fond of using balms on my body (they feel too heavy on the skin due to the waxes) but on small areas of skin, like hands, fingers, nails and cuticles, that's fine. 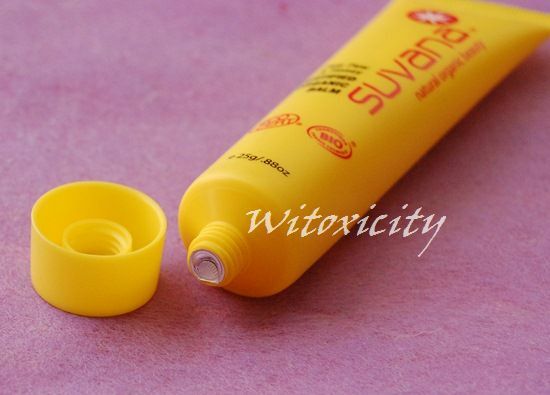 I do use Suvana as a cuticle balm once in a while, especially when I'm travelling (my main one is the Burt's Bees Lemon Butter Cuticle Cream). • Eyes - I had read that some ladies use it as an undereye balm on a regular basis. As for me, I had used it on the outer corners of my eyes when I was away from home for a few weeks. I didn't bring my regular eye cream with me, so the Suvana balm worked well as a temporary substitute. Just a very thin layer would do. • Minor scalds - along with some other multi-purpose balms, I also use the Suvana Paw Paw & Honey Balm on scalds - very helpful for little mishaps in the kitchen. Suvana uses recyclable packaging. Its tube design is reminiscent of that of Lucas Papaw's, no? About the same size, same weight (25g), just different colour. The tube is very handy to carry around in the makeup bag/handbag/luggage or toss around in the kitchen drawer. It's light and you don't have to worry about it breaking/spilling. This balm was my trusty companion when I was travelling recently. As I alluded to earlier, I used it as my night-time lipbalm, my eye balm, my nail/cuticle balm and as a relief for my eczema flare-up. At home, I tend to use it as just a lipbalm and for minor scalding incidents in the kitchen. A handy one, this, and made with good, organic ingredients too. Don't we all just love a product that can multi-task? I bought my tube last year from the UK-based Pawpaw Shop, an online shop I discovered while doing some research on the Lucas Papaw Ointment, ironically. The Suvana Certified Organic Paw Paw & Honey Balm is going for £6.99 (25g / 0.88oz). That's cool. I've never seen that product before and I live in Australia hehe I'm going to keep my eye out for it. Would like to try an alternative to the paw paw ointment.